Every homeowner, at some point during the time of owning your own home, is faced with the day when one of your appliances needs replaced. Maybe it’s just outdated and you need a new one. Maybe it stopped working at the most unfortunate time. Or maybe you took a sledgehammer to it and broke it into a bunch of dented pieces because it quit working and is now forcing you to spend a bunch of your hard-earned money that you had set aside for a family vacation on a new stupid refrigerator… I digress. 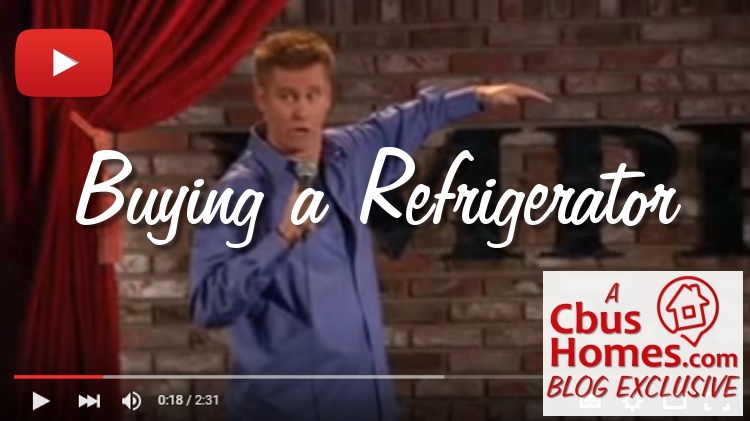 Stand-up comedian Brian Regan here gives his hilarious take on what happened when he needed a new refrigerator and went to buy one. Let’s just say, hilarity ensued. Columbus homeowners in need of repairing or replacing your worn out or dated appliances? Need the name of a repair company or where to find the best deals? Feel free to get in touch with me. Being in the business of homes, I often times know about these things and may be able to help save you a few bucks in the process.